When you have a birthday coming up you probably start dropping hints about the latest techno-gadgets you’d like to have. As for me, I’m hoping for a WABAC Machine. I’ve always wanted one. It comes from growing up in an old house, in an old village, both steeped in history. And some of that soul seemed to be embodied in The Brick, which we discovered when we moved into the house. 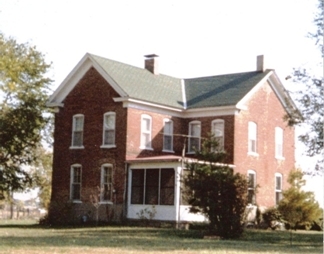 1874, the date the house was built, was engraved on it. I used to run my fingers over that date, wishing I could be transported for a visit to that time so long before. Later, I discovered another treasure in the neighboring town’s library: The History of Macoupin County. From it, I was amazed to learn that Woodburn hadn’t always been so small. Once it had been a thriving little town with numerous stores, including the one owned by Mr. Welch, the builder of our house, which had stood where the petunias grew in our front yard. 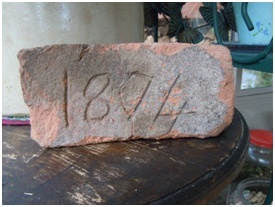 I learned that the brick for our house had been made in a brick works right there in Woodburn. That where our pasture was there once had been a livery stable and blacksmith shop. That down the street from us once stood an inn that served as a stagecoach stop. That Abraham Lincoln used to travel through our town and sleep in the inn and some of the houses too. I used to tell the kids at school that he slept in my house. How I wish that were true. But since the house was built in 1874 that wasn’t likely unless he had managed to be reincarnated and decided to come back for a visit to Woodburn for old time’s sake. My brothers and sister and I were thrilled the summer we discovered Mr. Stevenson had an actual stage coach stored in his old barn. We may have trespassed just a bit to sneak in and explore this wondrous relic from the past. I loved imagining the bustling little town. Late at night I could almost hear the sounds of horses and wagons clomping down the street, the stage coach rushing by, the blacksmith clanking out horseshoes. I could read the history books, and I could imagine those earlier days. But I always yearned to know more. 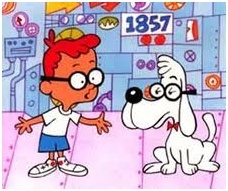 So when the cartoon Sherman and Mr. Peabody was first televised on our black and white TV set, I loved it immediately because they had a time machine called The WABAC Machine. In each episode, Sherman and Mr. Peaboy got to go back to visit different places and eras. Of course their take on history was always humorously skewed. I laughed at their antics, but inside, I really wished I had a WABAC Machine of my own. All that history seeped into my bones as I grew up in that old house there in Woodburn. It’s no wonder when I began to write historical fiction that it all came spilling out. And though I never have been able to acquire the means for time travel myself, I am a generous creator and allow my characters to go back to discover what the olden days were really like. 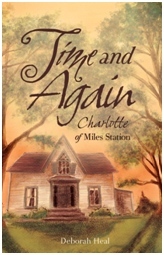 Deborah Heal is the author of Time and Again: Charlotte of Miles Station, an historical novel for young adults. You may read more about the book at http://www.deborahheal.com, where Deborah hosts Write Brain Activity, her blog for “bookies” and aspiring authors. This entry was posted in Guest Post and tagged author, historical novel, Illinois, Woodburn, YA. Bookmark the permalink.